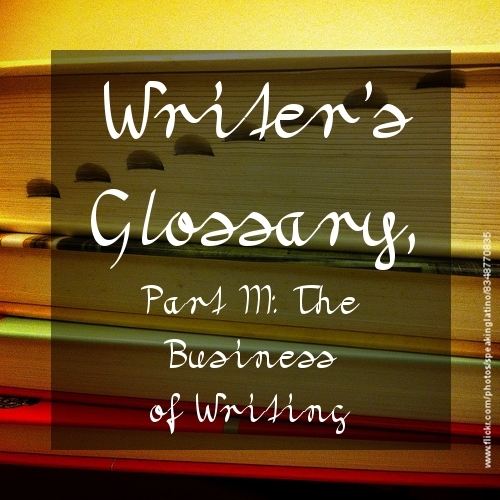 This is the third installment in the ongoing Writer’s Glossary series. Part I covered Elements of Fiction Construction and Part II covered Genres, Subgenres and Supergenres. Hook: the opening sentence or sentences that involve a reader. A narrative hook may be found in a novel. The hook of a query letter is a single sentence that intrigues the recipient. These vary by publication but this is a basic guideline. Always check on the expectation of word count with the publication. For example, Toasted Cheese has a maximum word count of 500 words for flash, 5000 words for fiction. Partial: A portion of a manuscript. The length varies. Standard is up to 25 pages or perhaps up to 10,000 words, likely less. Partials are usually requested or you will be given other indication as to what the length of your partial should be. FNASR: “First North American Serial Rights.” When submitting a piece for publication, the author sells or gives the publication the right to be the first in North America to publish the material once. Unless the author grants other rights or licenses as well, all copyright to that material reverts to the author. First Electronic Rights or First World Electronic Rights: the right to be the first to publish the piece on the Internet, via e-mail, as a downloadable file or program, on CD or tape, etc. FER/FWER are negotiated separately from other First Rights like FNASR. Nonexclusive rights: the piece may be displayed, published, copied, transmitted, etc. elsewhere while under right. Lead time: the time between the undertaking and completion of a project. For example, the lead time on a newspaper article would be from the assignment of the story until the print deadline. Self-publication: the publication of material by the author of the work, without the involvement of an established third-party publisher, vanity presses, or print on demand (POD). Many authors began or continued their literary careers as self-publishers. Sell-through: the percentage ratio of the number of copies produced/sold to the number of copies returned to the publisher for credit. Basically supply and demand. Chapbook: a small, pocket-sized book, usually with a flexible cover (of cloth or paper). Most often chapbooks are collections of poetry although they may also contain short stories or other creative media, usually with a unifying theme. 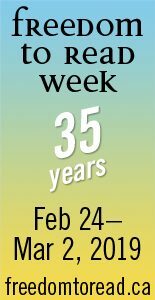 This entry was posted in AB 2010, Absolute Blank and tagged Articles, Baker, Business of Writing, Stephanie Lenz, Writer's Glossary by TC Editors. Bookmark the permalink. Home Team or Away? The Low-Residency vs. Traditional M.F.A. TCLJ welcomes reviews of books by writers who are a part of the TC community (e.g. published in TC, written for Absolute Blank, interviewed at Absolute Blank, forum members). For feedback on your unpublished work, check out our forums. If you would like to receive TC posts via email (or your WordPress reader), click the “Follow” button in the bottom right corner of the page and enter your email address. You will receive a confirmation email, so keep an eye out for that. Once you’ve confirmed your subscription, you’ll receive each new TC post by email. The Spring 2019 Three Cheers and a Tiger Writing Contest is CLOSED. TC Editors on The Spring 2019 Three Cheers and a Tiger Writing Contest is CLOSED. Miguel A. Rueda on The Spring 2019 Three Cheers and a Tiger Writing Contest is CLOSED. Willow Croft on Fall 2018 Three Cheers and a Tiger Winners!